Since 1979 an International Conference on Magnetic Fluids is held every three years. 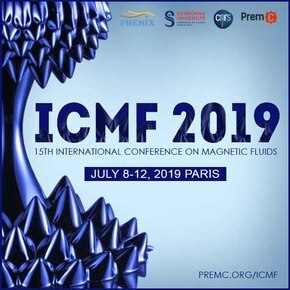 This conference brings together the international scientific community involved in magnetic fluid science, at large, from liquid dispersions to more complex fluids such as magnetorheological fluids, ferrogels, ferronematics, ferropolymers, biocolloidal systems…. The last two conferences were held in New Delhi (India) January 7-11, 2013 and in Ekaterinburg (Russia) July 4-8, 2016. Next ICMF 15th will take place at Sorbonne Université in Paris (France) July 8-12, 2019. The conference will highlight synthesis and properties of innovative magnetic materials with a special emphasis on societal applications in the domain of energy, environment and biomedical. More Keynote speakers will be announced soon.